The dining room is not just a place to eat. For some people, a dining room is a crucial place where you spend intimate time with family, impress an important client or have a weekend party with your closest friends. That is why you need to pick a right dining table that can fulfill your purpose and personality, but without losing the aesthetic point. So here are our picks of beautiful dining tables that will match your house and personality well. If you live in a modern-minimalist house, big chance you are an independent person that love something simple and practical. You will love a minimalist metal table that will hold 4-6 person when you decide to entertain companies. It is easy to clean up, durable and get along very well with your overall interior. To avoid making your room feels cold and too practical, add long wooden benches instead of chairs and play with a lighting system and wall decoration. You are a family oriented and nature lover if you decide to invest your money in a farmhouse. The farmhouse typically has a wide and spacious room, therefore a big solid wooden table will be perfect sitting in your dining room. Try to pick a rustic style finish with a distinctive grain and natural finish. The worn out patina color will add authentic vibe which will add more character to your house. Combine it with a set of colored wicked chairs in matching color for final homey touch. The European house has its own charm and timeless elegance. Those who own this type of house usually come from a big family that holds into traditions. A large oval table will be perfect for your family dinner and gathering as well as maintain the character of your house. The shape can create intimate seating position that allows conversation flows naturally. It also will impress your guest and client in a fancy business dinner with a matching cuisine and table setting. Opt for an elegantly upholstered armchair to make your dining room look more luxurious and impressive. You love a city life that keeps bustling and never sleeps. Your youthful personality makes you surrounded by a lot of friends and love to hang out. An elevated dining table with bar-like stool will be a nice choice for your dining table, so you can feel like relaxing in a lounge at your own home. This kind of table makes your home a favorite party venue on the weekend. Get a knack for some wine tasting night? Do not worry, now you can do it in a friendlier atmosphere of your own dining room without losing the club vibe. The industrial dining room has its own edgy personality that wins many hearts due to its bare aesthetic and basic arrangement. What makes this style more interesting is how it does not feels cold and sparse even with the minimum finishing. On the contrary, the industrial dining section will spark elegance and modern vibe when it is done correctly. Here are 5 ways to create an Industrial dining room in your own home effortlessly. 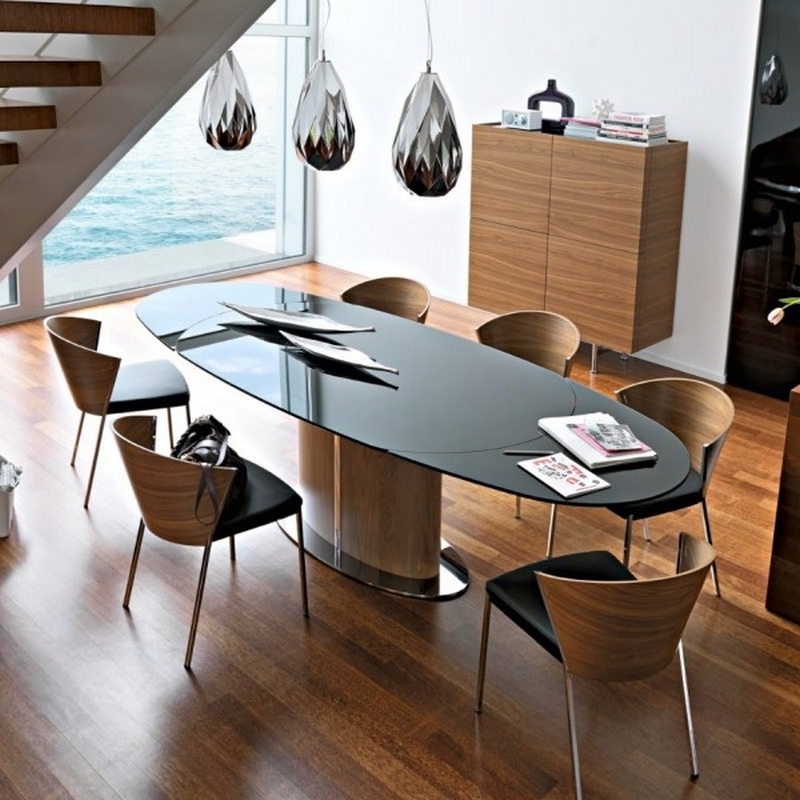 The key point of creating this type of dining room is by using a basic material in its original texture. You will need to let the brick stay barren, the wood coated in natural finish and implementing a lot of metal ornaments. Surprisingly these contrasting raw surfaces emanate such elegant feeling with a right proportion. Combining several different materials on furniture and ornament will help you perfected this look without making it look shabby. Another reason why the popularity of this time grows rapidly every day is that it is simply minimalist. To create an industrial dining room it is better to use a limited space that has to be shared with another room. You also have to keep the main color into minimum and go heavy on the texture. Use a dominating texture instead to shape the ambiance such as grey concrete or broad brick wall as the focal point of the room. Even if it is true that the industrial dining room did not require too much fuzz, you have to be really aesthetic to make it works. The style’s beauty relays heavily on the ornaments that complimented the look. You need to go unpredictably in this area to create the look that you are after. Blend the chairs of several materials, put a crafted dining table, and put a real greeneries are some ideas that you can try on. You can say that this is the most exciting part of building this kind of dining room because you can experiment with a lot of texture. The last but not least is to decide the lighting system. Lighting plays an important role in making an Industrial dining room because the option is limitless. You can go with a row of Edison’s hanging from metal pipe to artistic arrangement of large clear round hanging lamps. Since the color palette is very minimal in this style, the lighting is really needed to create a more dramatic feeling. Of course, you can still use a natural light, but we believe it is the night that will make its true charm shown. Having an actual dining room is a privilege for some people. Especially if you live in a studio apartment that is so tiny that the thought of adding more rooms is already overcrowding your living space. But still, you will need a space to eat, besides your favorite sofa in front of the television. The solution is to create an eat-in dining space in your kitchen that can hold minimal two people and even more when you need to invite guests. With the smart arrangement, your tiny dining space can be adequate enough – even enviable – to entertain your special guest. Here is how to squeeze a dining room in your kitchen without limiting your movement. If your kitchen even too small to accommodate a table, you can use the space on the wall or by the window. This is so much more fun than having a breakfast in the kitchen counter. You can enjoy your tiny garden during the meal time while getting ready to face the day. If you feel the long bar-like counter is too tiny for your dining, add some half-rounded table instead and a couple of chairs. Your romantic dinner for two places is ready to impress your date. The roundtable is the least awkward shape when you need to access your surrounding freely. If your kitchen already small, putting a cute round table for 2-3 people is enough to accommodate your meal time. You can pick a wooden table with slim legs and set off a thin chair to avoid overcrowding the room. With an addition of warm ethnic rug, your small dining room is ready for your real breakfast time. When you often have guests more than one, or have a little family, having a dinner table with some chairs is crucial. The sunny corner in your kitchen is perfect to put multi-shape seating arrangement. You can make a long bench on the corner and add a couple on the other side of the table. This dining nook can create a small cafe ambiance that surely will stir your appetite and make the conversation flowing smoothly. Your kitchen countertop can be your favorite eat-in dining table. Have it custom made so it can fit snugly in your petite kitchen with extra room to keep the chairs tidy when you do not use it. The side of the counter can be a perfect place to keep the eating utensil as well. At least you have a space for a proper meal instead always lounging in a living room for dinner.